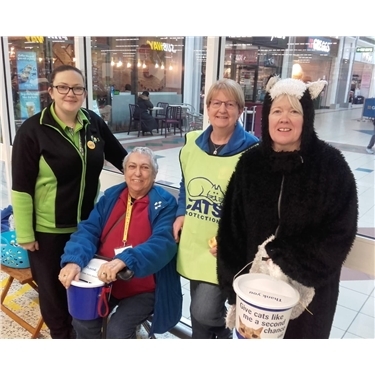 The weather may be cold – but not when you’re all wrapped-up in a cosy cat suit and meeting hundreds of warm-hearted shoppers at Asda Perry Barr - all giving generously to help needy cats and kittens in North Birmingham. And that was certainly the case on Saturday, the 26th January when several hardy Cats Protection volunteers took up poll positions with their collection buckets, smiled all day long, and raised almost £130 to help keep cats warm, dry and sheltered. Pictured is Bridget Sullivan-Blakeney, revealing her true identity briefly (not really a monster moggie!) Sue Morgan and Lee Herbert, along with Bella Thomas, the Community Champion for Asda at Perry Barr. Says volunteer Sue, also known as the can-shake-queen: “Our thanks to Bella, who not only got us a fund-raising slot in Asda’s packed diary, but was a great help on the day signing us in and out. She’s also kindly offered us the opportunity to hold quarterly can collections – and there’s a whisper we will be granted a spot for a Cats Protection Food Donation bin in store soon. We’re so grateful as well to all the lovely friendly generous customers and the cat-lovers who chatted with us and made the fund-raising day such fun." The volunteer collection day at Asda ran from 10 to 4.30 and, besides those pictured, Co-ordinators Jane and Nicole wish to thank volunteers Denise Atkins, Norman Targett, Jenny Reynolds and Kathy Porter. Anyone who would like to volunteer for Cats Protection in a fund-raising role or any other, call the helpline and a volunteer will make contact/call you back.